A Running of the Bulls in ’07 or Will ’08 Be Great? By virtue of an ugly loss at New Jersey last Wednesday night, the Bulls managed to go from a virtual lock to getting to the NBA Eastern Conference Finals as a #2 seed down to underdogs in the first round as the #5 seed against the Miami Heat. Even though the Bulls were able to dispense of Shaq and Dwyane Wade yesterday in game 1, I still have a ton of aprenhension as to the prospects of this team. Certainly, the Bulls are improved from the last year’s playoff run while the Heat are weaker with a less-than-100% Wade (which is still probably better than anyone else in the league other than Kobe Bryant and LeBron James). Yet, the Bulls pretty much had to ride a smoking performance by Luol Deng and a fourth quarter where Shaq and D-Wade spent a lot of time on the bench due to foul troubles in order to pull out a win in the comforts of the United Center. I think the Bulls may have enough energy and depth to get past the Heat in what could very well be a seven game series, but with the Detroit Pistons looming in round 2, it’s going to be extremely tough to get to the Eastern Conference Finals for the Bulls this year. That’s the thing with this Bulls team – I love their energy and defensive intensity, which means that they are able to hang on most nights with the elite teams such as the Pistons and Heat, yet they are also very capable of getting beaten by mediocre teams in any given game (i.e. their continuous problems with the Nets) since they don’t have a type-A scorer or a low-post force. Which brings us to the other side of this equation: this year’s NBA Draft. I’ve been writing about the potential Bulls 2007 draft pick ever since I started this blog, which was several months before Greg Oden even started looking for tuxes for his senior high school prom. As much as you hear about living for today, the fact of the matter is that this is going to be one of those history-shaking drafts that will determine the balance of power in pro basketball for the next decade. Unfortunately, the Bulls suffered another huge loss on Wednesday with the Knicks winning and moving up one place in the final league standings. That drastically reduced the chances of the Bulls getting one of the top two picks in the draft by virtue of Chicago owning New York’s pick from the Eddy Curry trade. Still, is there any NBA executive, shoe company, or basketball observer outside of the 4 or 5 Memphis Grizzlies fans out there that could possibly want the Tennessee club that holds highest odds to the top pick to get either Greg Oden or Kevin Durant when the marquee large market teams of the Celtics, Bulls, and 76ers are in the same lottery? David Stern can talk all he wants about how the 1985 Patrick Ewing draft wasn’t fixed in favor of the Knicks, but it’s time for him to give a little push in the best interests of the league. Even if the Bulls don’t end up with one of the top two picks (as you can tell by my over one-year long obsession with this draft, the Bulls being at the top of this lottery ranks just behind the Illini winning the national championship in terms of future sports wishes), the thought of the NBA’s next superstars in Oden or Durant toiling away in Memphis as opposed to one of the large markets, regardless of the presence of Pau Gasol, is simply horrifying. The Bulls already have the talent that could get to the top of the Eastern Conference in 2007. The outcome of this draft, though, is going to determine whether the Bulls becomes the only NBA franchise other than the Celtics and Lakers to have multiple dynasties starting in 2008. Reason(s) the Bulls played so well: Deng was on fire, Gordon played a complete game (points, rebounds, and assists), Thabo shut down Wade while he played, the Heat were in foul trouble, the Bulls have a deep bench. 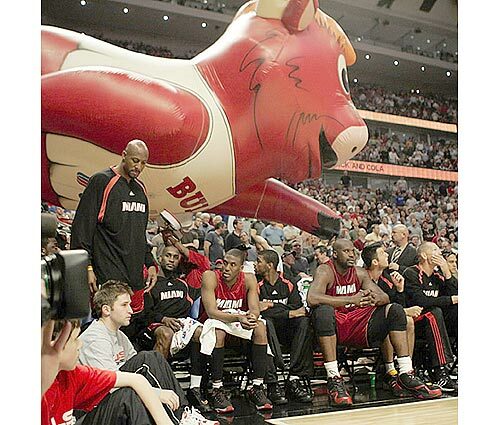 Reason(s) the Bulls didn’t play that well: Kirk was firmly affixed to the bench, the Bulls had more TO’s. So what you have to ask yourself is, from among reasons the teams played so well, what’s going to drop off, and from reasons the teams didn’t play that well, what’s going to pick up. Obviously Wade and Shaq are going to have more of an impact, which scares a lot of people, but I think that impact won’t be as big as people are expecting. Shaq is very good, and we don’t have an answer for him, but I don’t know how good he is at this point in his career. Wade was clearly the engine that carried them last year, and right now he just isn’t healthy. He’s still damn good, but he almost seems a bit tentative when it comes to contact. Plus it’s hurting them on defense. Ideally he would guard Ben Gordon, but I think Riles wants to protect Wade from constantly running into screens (and hitting his shoulder) so he’s put Wade on Deng and Jones on Gordon. First off, Jones is too slow to stick with Benny G, so I think he will continue to have a good series. Jones a few years back would have been hell for Ben, tall, physical guard and all, but I think he’s tailed off enough that it works to our advantage. Then when you look at Deng, there’s another mismatch. Deng has 4 or 5 inches on Wade plus he has really, really, Jamal Crawford-esque arms. Wade is an adequate defender when healthy, but that’s just a mismatch right there, which probably helped contribute to Deng’s stellar shooting performance. In all, I don’t think the drop off from Deng and Gordon will be as steep as expected, and I don’t think the upswing from Shaq and Wade will be as great as expected. Combine that with the fact that Kirk Hinrich is really good and Antoine Walker is really bad (and fat, and whiny, and…) and I think the Bulls are in good shape. Then again, that could just be my bias kicking in, but oh well.